This house was the first of the fourteen houses that Healy constructed on the block. Built in the Queen Anne Style with a tall intersecting gable roof, on the northern façade is a gable end that projects over a two-story bay window and an oriel window clad in fish scale shingles. On the main façade clapboard siding and original window and door openings are intact. Because of alterations, the house is considered a secondary contributing structure, however the original carriage house at the back of the lot, somewhat altered, contributes to the historic district. This was the first of three houses that Healy himself occupied on the block. The other two houses that Healy occupied still stand at 3115 2nd Ave. South (1891) and 3131 2nd Ave. South (1890). 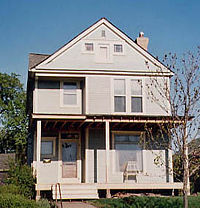 The original building permit lists Healy as the owner and the estimated construction cost as $2,200, which if accurate, makes it the least expensive to construct Healy house on the block.